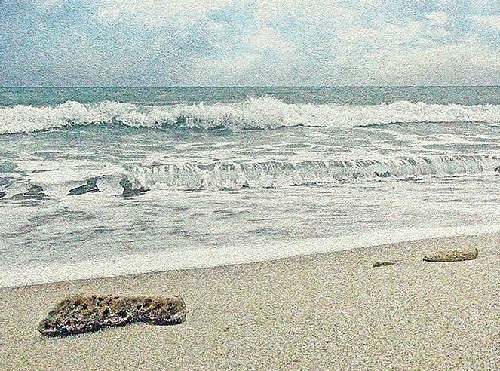 Many connoisseurs of unique things know and love Alexander Nartov’s quartz sand art. Who would have thought that an ordinary sand can be so interesting artistic material giving a space for imagination! Since for the creation of works the basic material has become quartz sand, then a new technology was called Quartz painting. 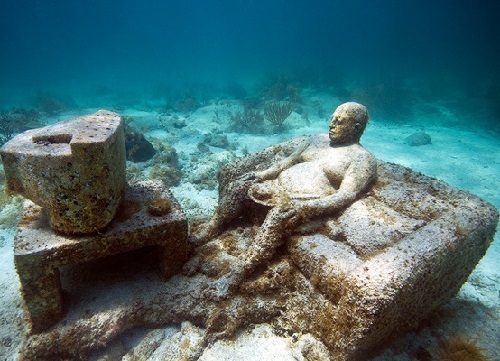 In 2003, Russian artist Alexander Nartov received a patent for the technology. Since that time, he has created a large number of paintings from quartz sand in various genres: still life, landscape, abstraction and even portrait. Everything is possible! Born in 1985, Lisbon based artist Glam (Catarina Monteiro) created these illustrations for a group exhibition of movie posters. 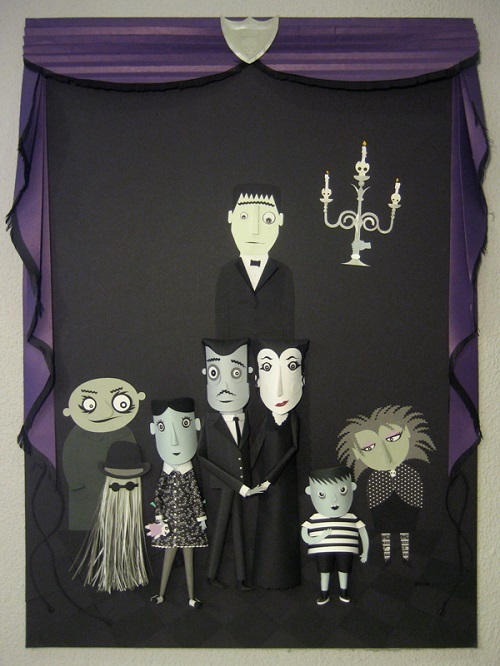 In fact, the artwork of well-known creatures hidden in the dark – based on the movie “The Addams Family”. Catarina Monteiro has a degree in Communication Design from the School of Fine Arts University of Lisbon. Meanwhile, the young artist Glam has 15 years of experience in the world of street art, starting her creativity at the age of 15. She is a permanent participant of all street art festivals. Among her artworks, in particular, are several works, including “Blue Wall” – Psychiatric Hospital in the center of Lisbon (Julio de Matos Hospital). Besides, Seixal wall graffiti in 2013; Wall store Montana and others. In addition to the graffiti, Glam works in the field of paper installations – illustration and paper sculpture. Her name is known in several European cities: London, Rome, and Barcelona. 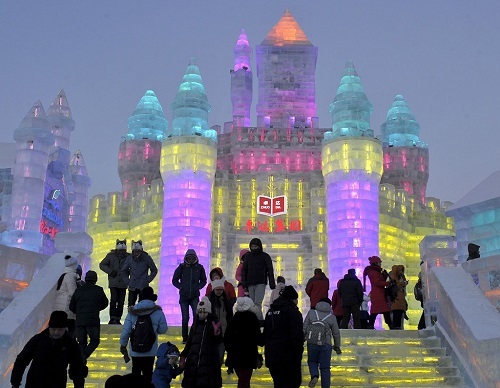 January 5, 2015 in Chinese city of Harbin started the 31st annual international festival of ice and snow. Thousands of snow artists and sculptors from around the world have built a city of ice sculptures. At night, the ice city illuminated by LED lamps and lasers, creating a vibrant artistic and architectural images, looks especially beautiful. In fact, it is a creation of four Brazilian graffiti artists – identical twins Otavio and Gustavo Pandolfo, Nina Pandolfo and Nunca. 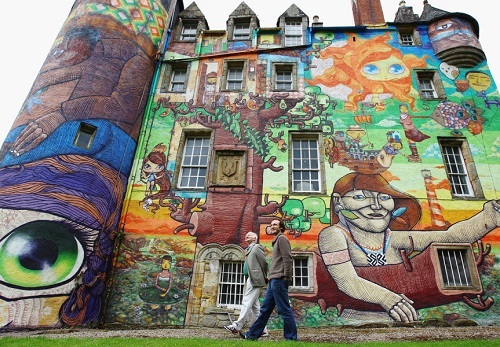 Built in the 13th century, Kelburn Castle is 35 miles from Glasgow, and as you can see, has a rather unusual facade. Renovated by Brazilian street artists in 2007, the facade looks extraordinary. Originally, it all began when the Earl of Glasgow, Patrick Boyle learned that cement that have been added in the process of renovation in 1950 must be removed. At the request of his son, he decided to radically change the look of the castle – so that nothing reminded of the cement restoration. So, he invited graffiti artists to paint cartoon characters and chromatic structures on the castle walls. 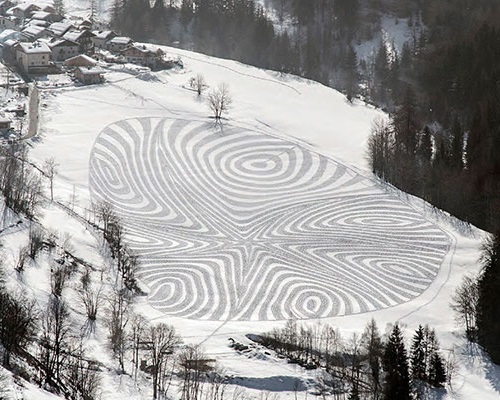 According to English land artist Simon Beck, it all started when he bought an apartment in French Les Arcs in 2004. One evening, after the lifts closed, he went onto the little snow covered lake, plotted 5 points in a pentangle; and joined them up to make a star. He then filled in the 15 triangles that resulted and later added some circles and the result was impressive. When fresh snowfall covered the design he did another more complicated design. It took a while for the idea to take off. “Without snowshoes it was too physical and I abandoned it, and I didnt have a digital camera nor was there internet in Arc2000”. Traditionally, the Niranjana Public Welfare School in India provides its building to the full disposal of artists. And they can demonstrate their unlimited talent, skill and boundless imagination. Accordingly, the walls and ceilings of the school – transformed into the canvas on which appear scenic paintings, landscapes and fantastic creatures. 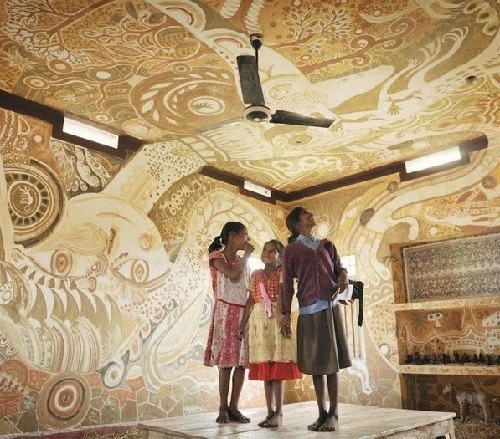 However, the most amazing thing is that these wonderful murals – painted with ordinary mud! The material, which in this poor area has unlimited quantities. Meanwhile, the Niranjana Wall Art festival gathers artists from India and Japan. They spend three weeks there, not only creating their masterpieces on the walls, but also interacting with the students of the school. In addition, conducting workshops, they share with the students the spirit of creativity and art.